Turning warmer tonight/tomorrow across PEI..
Friday, October 19, 6:50am.... Brisk NW winds will slowly diminish today as a ridge of high pressure approaches crosses the island. Clouds will then begin to spread across the island as a warm from approaches. This feature along the ridge of high pressure will result in a wind shift to the SW which will also see a moderation in the temperature. Another strong low pressure system will be tracking across northern Quebec on Saturday which should spread some showers across the island beginning near noon along with very mild air for this time of year. The associated cold front will then sweep across the Martimes near dawn Sunday morning bring a return of the colder air on W-NW winds. Low pressure will then develop along this front as it moves off the coast of NS. This new low will then move NE as it ripple along the frontal zone later Saturday. 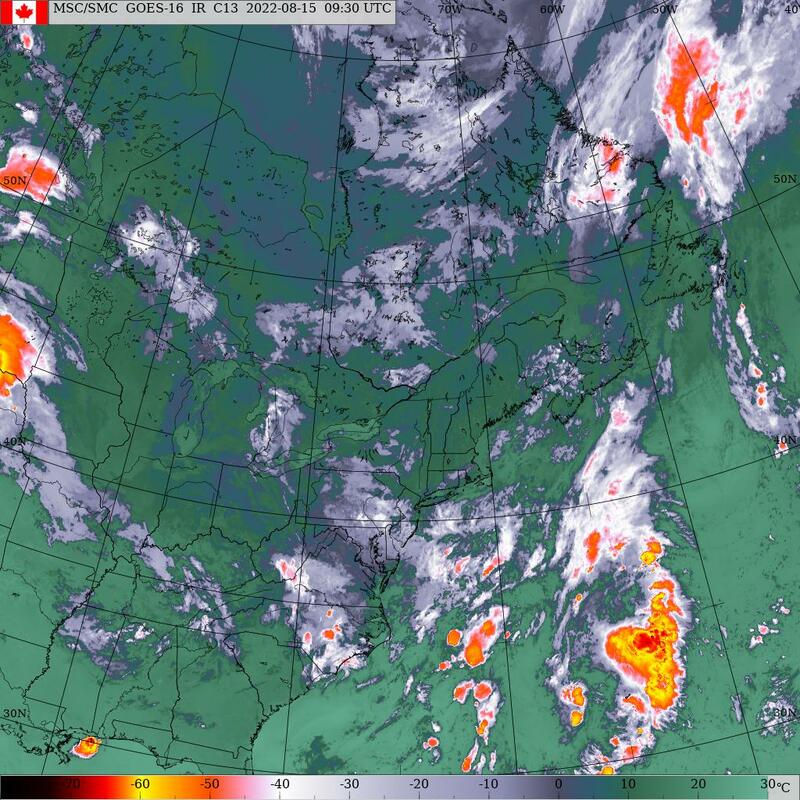 Heavy rains associated with this new system will effect eastern PEI and Cape Breton overnight Saturday night into Sunday morning. Cold W-NW winds will continue Sunday and Monday as high pressure slips south of the Maritimes over the mid Atlantic states. These winds will give cloud and showers/flurries where they blow onshore (eastern PEI, Cape Breton). Skies cloud over later Monday as the next weather system approaches from the west with rain beginning Tuesday afternoon. Winds increase and along with a steady rain Tuesday night as the low intensifies as it tracks across central NB into the southern Gulf of St Lawrence. This new storm system then lingers over the Gulf through the day on Wednesday with wind, cloud and showers expected. Cloud, wind and showers/flurries then continue Thursday and Friday as the system pulls away and high pressure builds in from the west. Precipitation.. Could be a left over flurrie down east this morning but a drying trend for today. Showers begin near noon tomorrow possibly becoming heavy at times for eastern Kings county where 15-20 mms possible. This will all depend on how close this low tracks to Cape Breton. Western PEI may escape the rain completely. Lefty over showers on W-NW winds for Sunday will change to flurries Sunday evening as temps fall. Monday is looking cloudy but dry. Rain begins Tuesday afternoon which continues all night tapering to showers by Wednesday morning. This system could give another 15-20 mms province wide. Showers continue Wednesday changing to flurries for both Thursday and Friday. Temperatures.. Cool again today, warming trend begins overnight tonight with temps actually rising after midnight. Tomorrow will be well above normal followed by a return to normal for Sunday. Cool on MOnday then another warm-up for Tuesday. Cool down for Wednesday through Saturday. Wind.. Brisk W-NW winds will diminish today then shift to SW this evening. These SW winds increasing to brisk-strong by noon tomorrow. Wind shift to the NW occurs near dawn Sunday morning and continue through Monday. Southerlies develop on Tuesday. Hazards.. Rather quiet today.. Wet driving condition sin rain beginning near noon tomorrow. Heavier rain possible tomorrow night down east. Strong winds expected to develop early tomorrow morning which may cause bridge restrictions.